Our skin is home to a trillion of rich and diverse group of microorganisms such as bacteria and fungi, known as microbiome. Not all bacteria are harmful; some of these are beneficial while others harmless. They remain diverse and co-exist with us to maintain our skin health. In eczema, this delicate balance is disrupted where there is a shift from a diverse profile to one that is dominated by opportunistic bacteria, in particular, the harmful Staphylococcus aureus (‘Staph’) bacteria. Staph is often responsible for known and quite dramatic complication of eczema; and in certain cases, it is hard to treat. Skin infection in eczema skin is always associated with Staph bacteria. These bacteria have been found to colonize in about 90% of eczema skin. 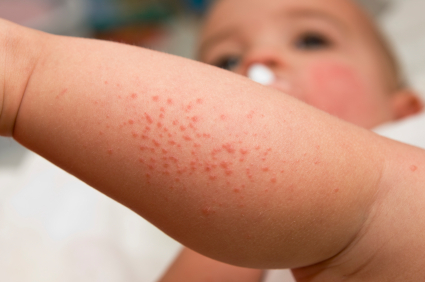 Eczema skin during severe flares up carries high levels of Staph, correlating with its severity. When the flares had subsided, the mix of bacteria present on their skin became more diverse. Staph is a very resilient bacteria that can survive on dry skin with very little oxygen and capable of causing infection once they colonize the skin. They act like allergens or irritants that produce a toxin, which triggers the protective cells of our immune system to attack and therefore, creates a vicious cycle of inflammation. And, they make the skin barrier even more leaky. As eczema skin has also been found to not be able to produce enough of a natural antibiotic – called the antimicrobial peptides or AMPs – to kill off staph, it leaves the skin at high risk of colonization and infection by Staph. Does your Child has Staph? Staph can affect any areas of the skin that is affected by eczema or any parts of skin that are damaged. After all, eczema skin has a compromised skin barrier and immune response is abnormal. If your child has hard-to-control eczema, you may consider that she could have a secondary skin infection. The chance is that she is also likely to have Staph on her skin. These bacteria may (or may not) be visible to your naked eye in the form of inflammation. MRSA (Methicillin-Resistant Staph Aureus) is a strain of Staph bacteria that is resistant to commonly prescribed antibiotics. Infections with MRSA are very difficult to treat. They can cause similar signs and symptoms as in infection with other types of common skin bacteria; even though MRSA infections generally progress dramatically causing large, painful skin abscess with pus. If your child is already on antibiotic to treat an eczema flare yet her skin still looks infected, she might have gotten MRSA infection. In this case, she may need a different antibiotic (e.g. Bactrim or Clindamycin) to treat her infection. Prevention: How to Reduce Staph on your Child’s Skin? Staph, including MRSA, can spread from skin-to-skin or by contact with contaminated surface or object. Generally speaking, if your child has eczema or is prone to skin infection, it is a good idea to clean and disinfect at least once daily. Focus on surfaces that are likely to touch your family members’ bare skin each day and any surfaces that can come into contact with uncovered infections, e.g. door knobs, faucet handles, mobile phones etc. The cleaning detergents and disinfectants (common household antiseptics that contain bleach, etc) are readily available in grocery or retail stores (make sure to read the label). Do take note that many such disinfectants only work if you leave it in contact with the surface for several minutes before washing. Wear gloves during cleaning to protect your hand. Bandage any wounds until healed. Do not share personal items such as towels or washcloths. Launder towels in hot water. The thought of using bleach on your child’s skin is very scary. But, this eczema treatment – (diluted) bleach bath – has been hailed to be effective in most cases as it is believed to have an antibacterial effect. Bleach differs from antibiotics in mode of action. It physically destroys the bacterial cell wall and proteins whilst antibiotics react with the proteins and nucleic acids to cause bacteria to create abnormal cell structures (which is why they can develop resistance). In bleach bath, after the bacteria are killed, they will degenerate and be cleansed away by bathing. When you mix correctly, a diluted bleach bath has the similar bleach level as normal swimming pool. A study has also shown that bleach bath does not negatively affect the skin. Find out more about how to make bleach bath in Don’t Underestimate Special Bath Therapies for Eczema. If bleach bath still scares you or if your child or yourself is resistant to bleach bath, dermatologists suggest Chlorhexidine, another antiseptic solution, to clean skin before applying topical steroid, especially on rashes that are red and persistent. Bacterial infection is not visible to naked eyes, hence some doctors find it to be good practice to remove bacteria first and if required, apply topical steroid after, so that it may be more effective without the bacteria. The way to use it is very straightforward and easy – just use enough to cover the area and rinse with water. Depending on the product and its given instruction, please read if you may need to leave it a bit longer before washing off. Please consult with your physician before using it on sensitive area such as head, neck or other sensitive part of your child’s skin. Antiseptic solution is very drying – just like alcohol is – so do not forget to moisturize, moisturize, moisturize! Who wouldn’t agree that scratching gives a ‘feel-good’ sensation? On the hindsight, it opens door to a vicious cycle of itch and scratch. Scratching can damage your child’s skin barrier and once it gets wounded or bled, it makes it easier for Staph, irritants and allergens to penetrate. This host of events lead to reactions that in turn make the itching worse – and the itch-scratch cycle continues. In short, the lesson is: ‘Prevention’ definitely beats having to treat a staph infection! So far, in most of the earlier chapters, we have covered much about emollient and effective moisturizing being such essential part of a good skincare routine that forms part of your natural eczema management. In these articles – Bathing Matters in Eczema: Tips for Bathing Your Eczema Child, What’s the Deal of Bath Products with Baby’s Eczema? 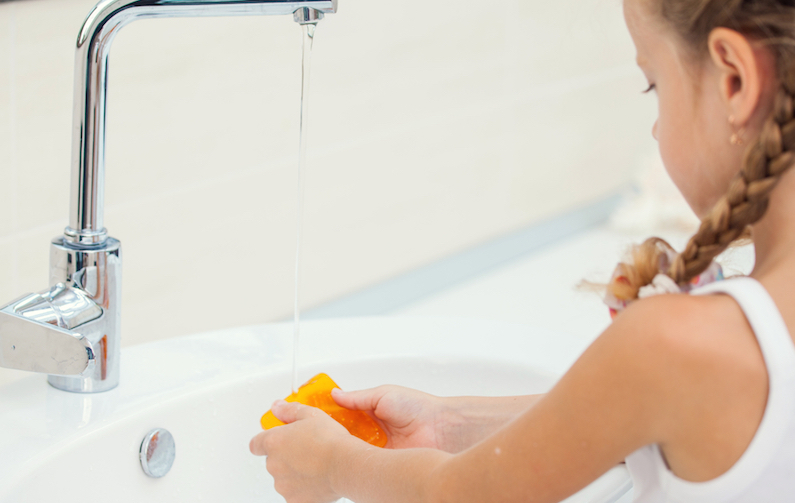 and Don’t Underestimate Special Bath Therapies for Eczema – we will take a closer look at what forms a good bathing or shower regimen for your child’s eczema. This entry was posted in Baby Eczema, Eczema & Bathing, Eczema & Dermatitis, Eczema & Infection, Itching & Scratching and tagged bleach bath and staph infection in eczema, eczema and skin infection, eczema skin and imbalanced microbiome, skin flora, staph bacteria in eczema.